Named after a slang term for soy sauce, Murasaki has been on my OC sushi to-eat list for a while now. 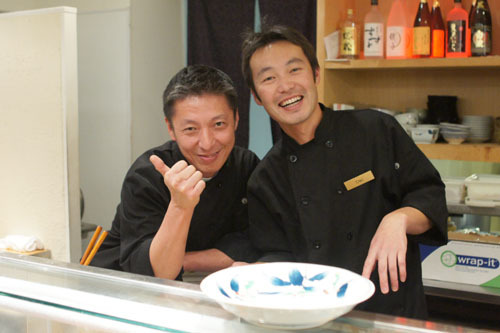 Opened in April 2007, the restaurant is owned by Tsutomu Saito (Tomu-san) and Daisuke Tamaki (Dai-san), who are also the two main chefs. I don't make it to Orange County too much these days, but a trip down to my wine cellar in Irvine gave me a good excuse to pop in for a visit. Inside, swaths of purple abound, fitting given that murasaki is also the Japanese word for the color. The decor is interesting, sort of a traditional sushi bar-meets-Pottery Barn aesthetic. There are a handful of tables available, but the real action is in front of the two chefs at the 10-seater counter. 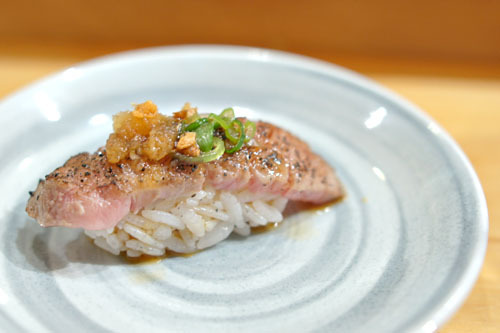 If you sit at the bar, you'll bypass the main menu (with its chicken teriyaki and other bagatelles) and go straight for an omakase experience. There's not really a set price, so the chefs will keep going until you tell them to stop basically. Our tab came out to a rather reasonable $106.95 a head for 25 courses, not including tax, gratuity, or beverages. Speaking of the tipple, you'll find your typical selection of beers, a few wines, and a decent list of sakes and shochus; I'd pay special attention to the seasonal sake offerings. Click for larger versions. 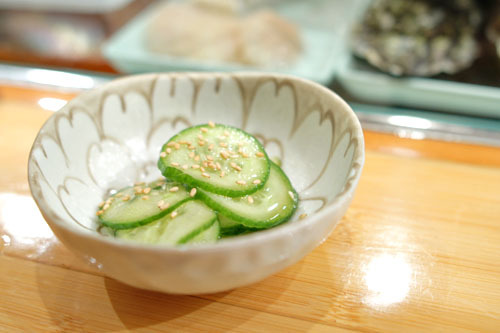 Along with the requisite gari, a small bowl of kyuri tsukemono (pickled cucumber) was placed before us. To drink, we ordered up a bottle of the Wakatake Onikoroshi "Akino Ki-Ippon" [$44], a tokubetsu junmai namazume sake from Shizuoka Prefecture. It was delicious, very fresh, and very smooth, with a distinct, yet delicate fruity character over a subtle base of savory complexity. Yum. 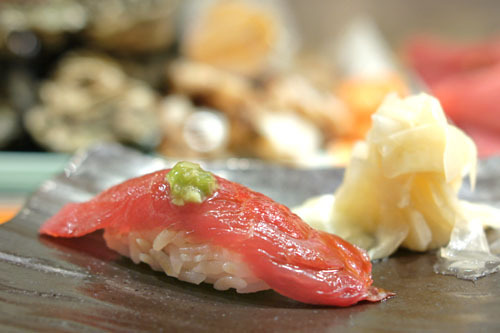 Our gauntlet of sushi got off to a strong start with this glistening, ruby red cut of blue fin tuna. 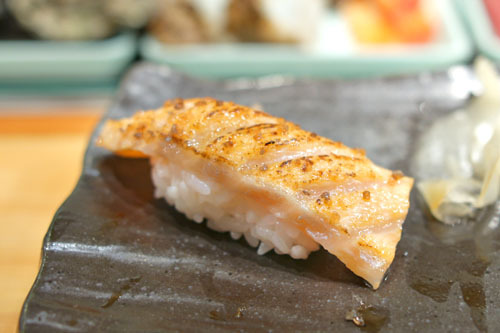 The fish showed off a surprisingly satisfying depth, with a delightful, creeping brine countered by the zing of wasabi. A serving of halibut was light, pillow-y almost, with a mild relish accented by the fish's tangy sauce and a bit of heat on the finish. 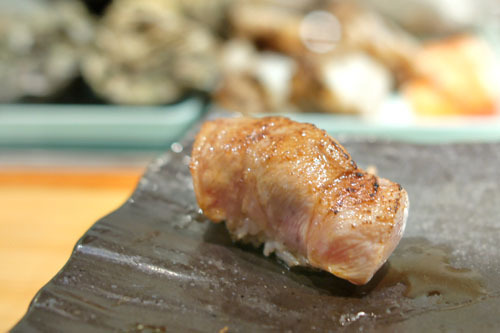 The ubiquitous yellowtail I found spot on: fatty and beautifully complemented by soy sauce, with a good wasabi burn toward the end. I quite appreciated the cross hatching pattern inscribed on the fish here as well. I'd never had a red snapper quite like this before. The fish itself was on point, but the crux of the course was the application of pepper sauce, which added a fantastic, lingering savoriness on the midpalate that really took the fish to the next level. Excellent. The seared scallop was outstanding as well, with the sweetness of the bivalve playing gorgeously off of the bitterness of the char, all while wasabi gave the bite a tinge of heat on the close. 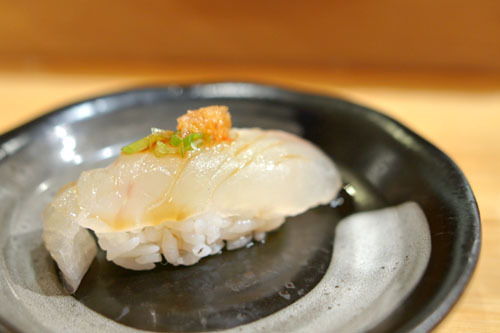 Amberjack was tarted up perfectly by a dab of yuzukosho, which added a salty, spicy counterpoint to the undeniably clean, focused flavor of the fish. Delish. I would've liked some amaebi somewhere in the meal, but a cooked presentation of jumbo tiger shrimp certainly didn't disappoint. 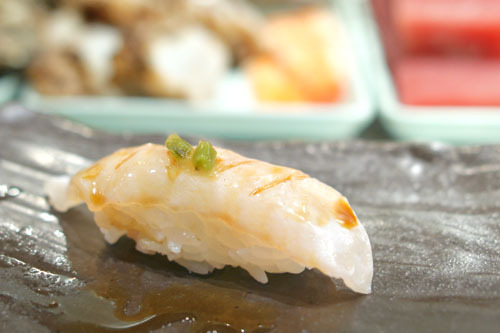 The snappy, springy texture of the ebi was much appreciated here, but the key was that intense, earthy, garlicky sauce on top, made using the liver of the crustacean. 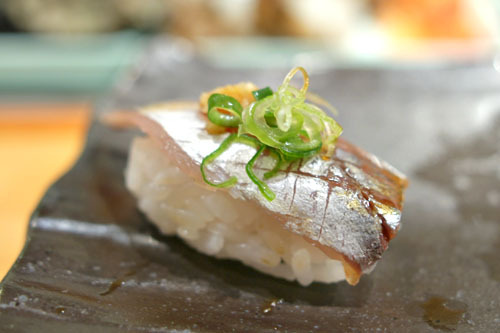 Next up was a prototypical presentation of horse mackerel. The scallion and ginger combo really contrasted the intensity of the fish here, but was actually a touch strong for me, as I would've liked the aji to have shown through more. The seared salmon belly was another standout of the meal: lush and fatty, and just bursting with smoky, savory, oily flair, all accented by a wonderful char and crunchy pricks of salt. Oishii desu. Tuna belly was just what I expected, conveying an unabashedly soft, melty consistency, loaded with fishy goodness and perfectly counteracted by the application of soy. Abalone I found delightfully crunchy, with a stark, saline savor that was nicely accentuated by the umami-rich relish of the nori. 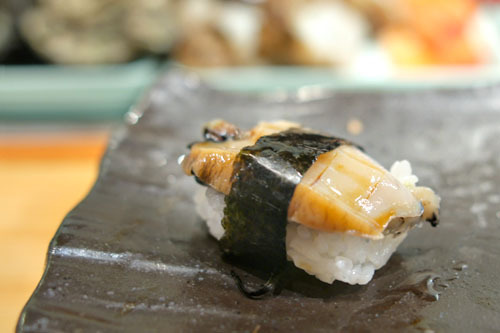 The geoduck, meanwhile, had a marvelous bite to it, simultaneously crisp, yet yielding, with a great brininess to boot. 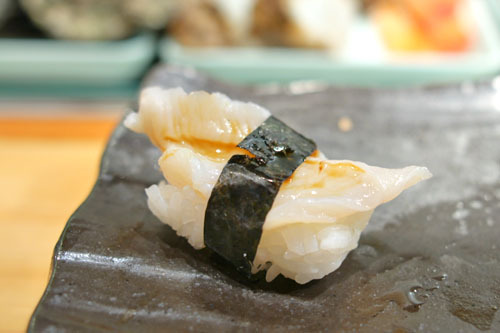 Murasaki's sea eel was truly something special, arguably the best presentation of the fish that I'd ever had in fact. The key was what my dining companion described as a "multifaceted salinity," a deft combination of salty, ocean-y flavors that worked perfectly in concert with each other. Loved the crisp "crust" on the eel, too. The sea urchin was cold, creamy, and sweet, with a lovely counterpoint in the form of the nori, but there was a bitterness on the finish that I wasn't too keen on. Tonight's wagyu was from Kagoshima Prefecture, and was pretty amazing, with the rich, luxurious nature of the beef deftly balanced by the astringent char as well as a lovely piquancy from its acidic dressing. 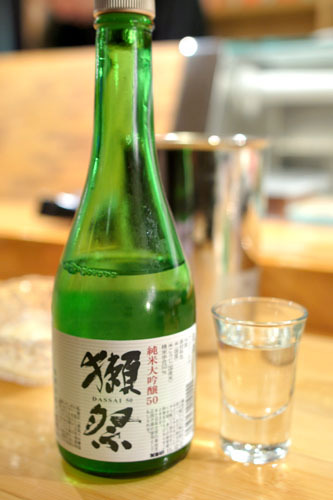 With our first sake all drunk up, we opted for a small (300mL) bottle of Dassai 50 Daiginjyo [$21] to conclude the meal with. 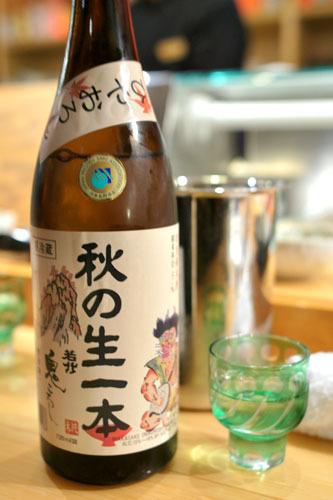 Compared to the "Demon Slayer" above, this one was heftier, with an almost sticky sweetness and round, viscous body and an undercurrent of rice-y and alcoholic notes. 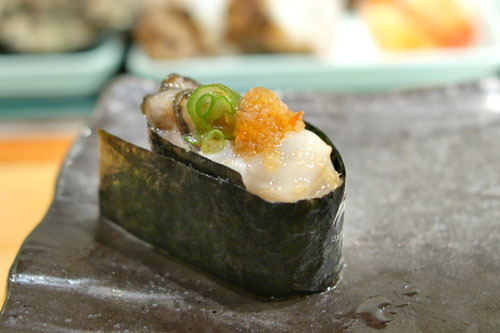 Oyster sushi utilized Kusshis, one of my favorites, and was delicious, with a great mix of sweet-saline flavors tempered by the use of scallion and momiji oroshi. 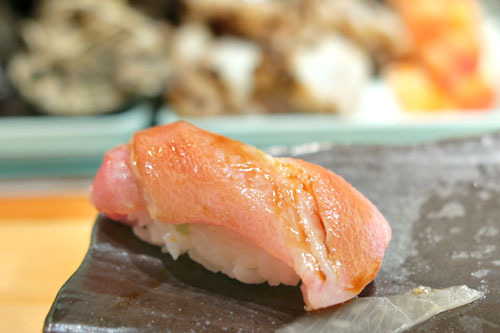 During this course, we started talking with Dai-san about oysters, and ended up suggesting that he look into Shigokus, which I'd first had at Ohshima. 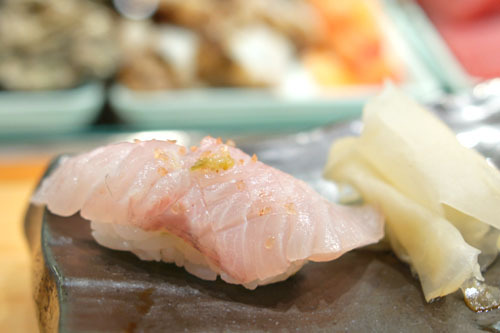 Interestingly, Dai-san mentioned that Ohshima's owner had just eaten at the restaurant days prior--it's a small sushi world. Halibut fin was a real treat as well, with its chewy consistency on proud display here. Lovely flavor too, with a nice tartness and sharp pinpoints of salt. 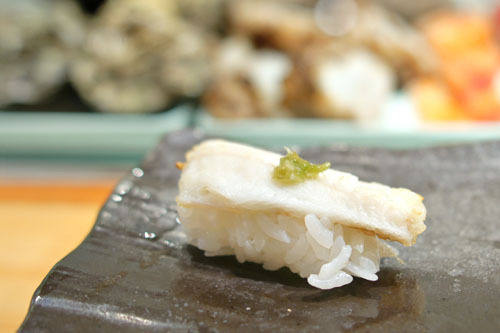 Squid was next, and conveyed a creamy, mouth-coating consistency and a mild relish set off by the use of shiso and ginger. At this point, Tomu-san brought out a beef course that he'd created on the fly. 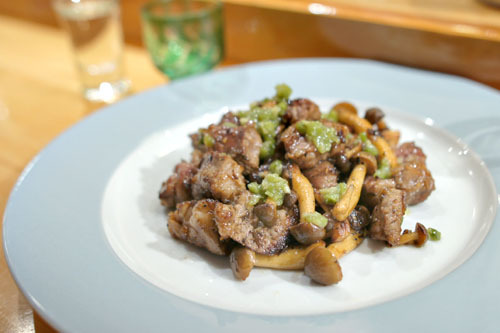 It was a hefty dish, with loads of bovine goodness and a lovely earthiness courtesy of the mushrooms, all accented by a kick of wasabi. I would've liked some more acidity here though, to balance out the intensely savory, salty flavors at play. 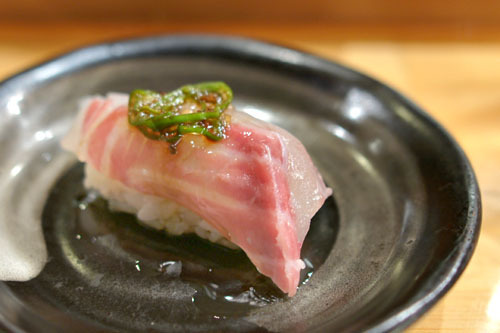 Moving back to sushi now, the gizzard shad was quite nice, firm in texture, with a great fishy character that was adroitly moderated by a small sliver of shiso. You can't go wrong with seared toro, and this was no exception. As expected, the tuna was wonderfully rich, oily, and yes, unctuous, with a superb char bitterness and a cool center, which made for an intriguing contrast in temperatures. 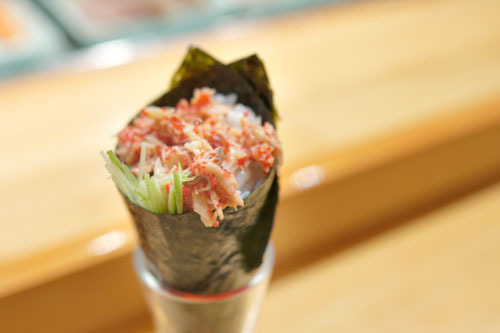 Here was Murasaki's take on the classic blue crab hand roll, and it was pretty amazing. 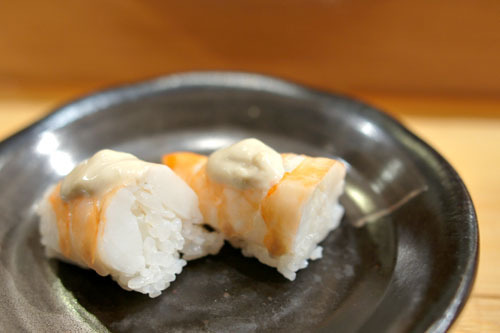 The cool, sweet relish of the watarigani certainly made itself known, but the heat from the capelin roe was a really smart move, serving to counteract, yet not diminish the natural flavors of the crab. Loved the astringent bite of the greens here, too. 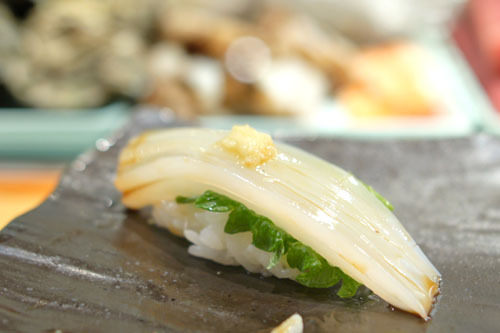 Next was a hosomaki filled with toro and takuan, with the weight of the tuna nicely offset by the crisp, tangy nature of the pickled daikon slices. 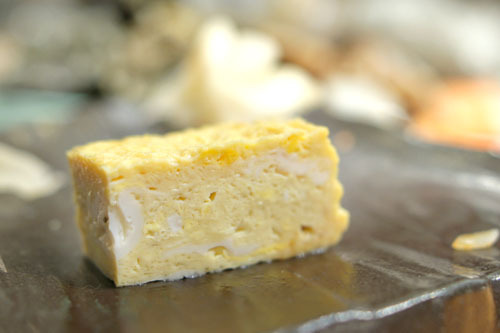 The standard finisher of egg omelet was right on the money: dense in body, with a cool, sweet, hammy flavor. At this point, we were offered our choice of sweets off of the dessert menu. Click for a larger version. 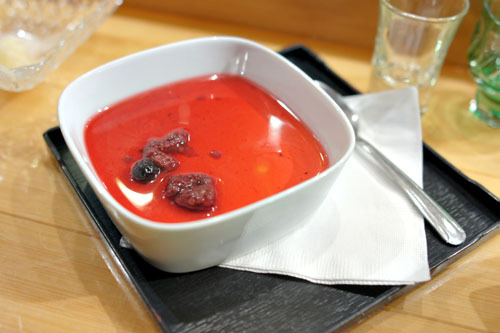 The soymilk panna cotta I found nice enough, with the light, subtly-flavored cream serving as a foil to the tart, tangy berry reduction up top. 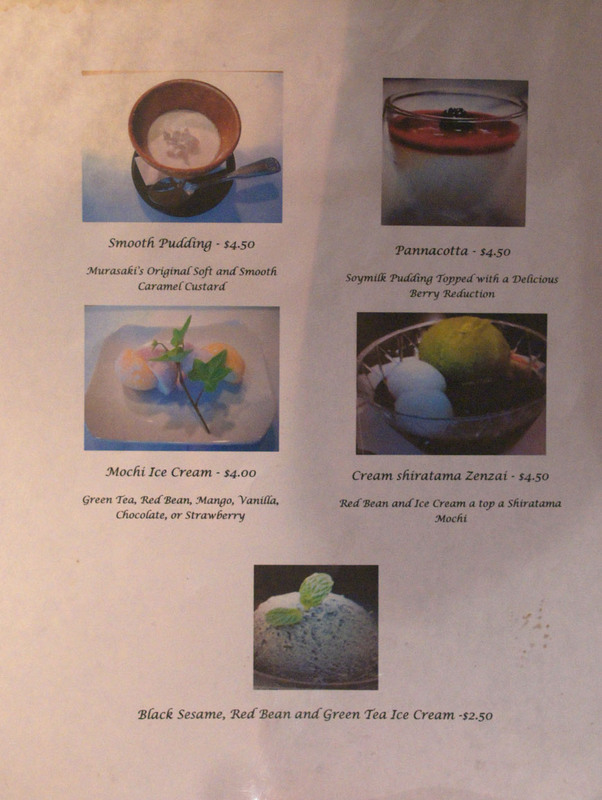 Last up was Murasaki's signature dessert, which is almost like a Japanese flan. 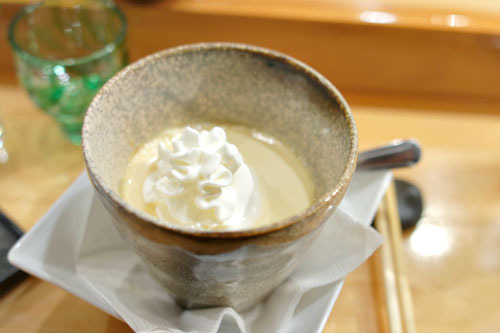 As the name implies, the custard was certainly smooth, with a mild vanilla flavor that played perfectly off of the sugary nuances of caramel present. The dollop of cream on top was a fitting touch as well. 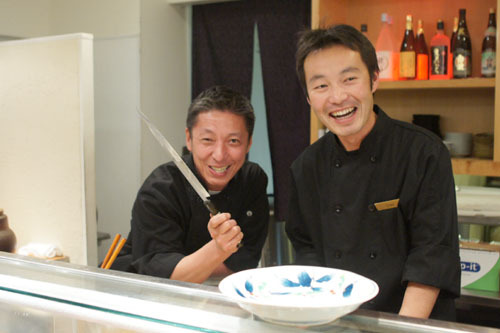 Chef/Owners Tomu-san and Dai-san are two wild and crazy guys. I'm certainly glad I gave Sushi Murasaki a go. 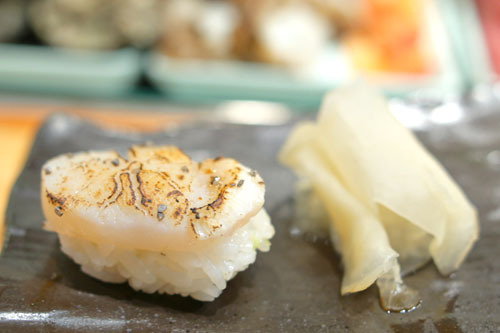 The food was largely delicious, with just a few minor quibbles here and there, and the lighthearted approach of the chefs was a welcomed change of pace as well (vis-à-vis the almost uncomfortably serious, stoic environs at a place like Kasen). It was definitely one of the better sushi experiences I've had in Orange County (and a good value too), and I wouldn't hesitate to recommend it for all my sushi aficionados out there. 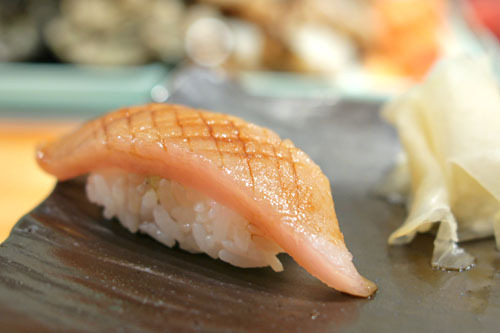 Amazing review of Sushi Murasaki! I haven't been back there in quite some time and definitely should go back as the array of sushi looks very delicious and fresh. 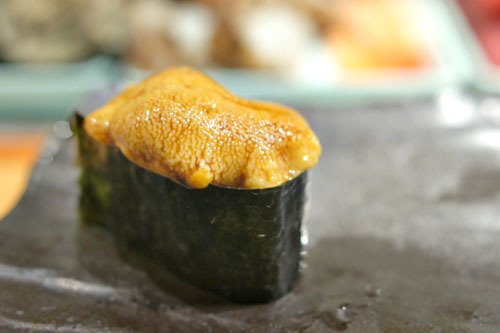 Although my go-to sushi place is Ikko in Costa Mesa mainly for their overall quality of ingredients (especially their Uni), what really makes me want to give Sushi Murasaki another chance is their use of ponzu for some of their sushi. 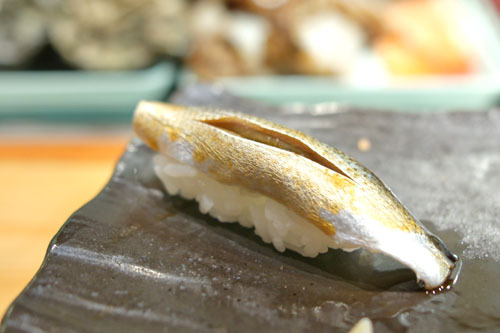 That seems to give them the edge over Ikko as the common complaint with Ikko is that some of their sushi tastes identical to each other as I've observed that they mainly use the same Tare or just salt to season most of their sushi. 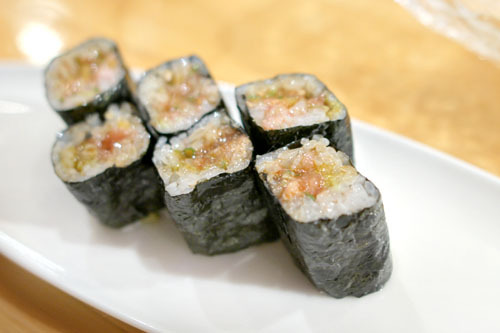 BT: I quite enjoyed Ikko as well, and I need to go back there and eat more of their actual sushi. Charlie: Yes they are. They don't take themselves too seriously, which is something that I'd like to see more of. Really makes you feel more at ease during dinner.